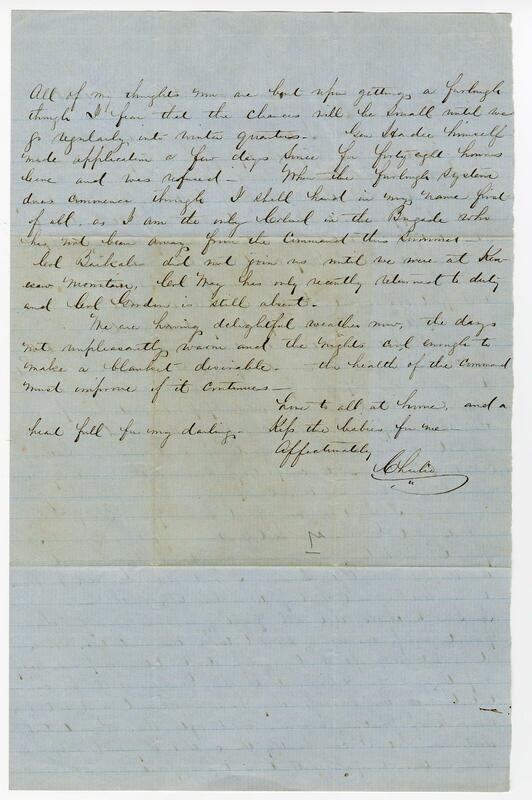 Item Description: Letter from Charles Olmstead to his wife dated Sept. 12, 1864 regarding the battle of Atlanta. Olmstead was a confederate army officer in the 1st Georgia Infantry Regiment. Item Citation: From Folder 5, in the Charles H. Olmstead Papers, #1856, Southern Historical Collection, The Wilson Library, University of North Carolina at Chapel Hill. I wrote you a good long letter yesterday but as an opportunity offers today I cannot resist the temptation to send you a few lines. The long expected mail came last night, and, to my, great disappointment, I received but one letter, dated August 17th, in which you advised me of having shipped the box that Charlie May could not take with him. However this is still a chance for me as I learn that the post office at Griffin is still crowded with mail matter that has only been partially distributed. The truce between the two armies commences today- as many wagons as can be spared have been sent forward to receive the refugees from Atlanta. Poor creatures, their’s is a hard case – a whole population driven from their homes upon the cold charity of the world. This one act places Sherman alongside of such men as Butler, O’Neil, & ?? . it completely obscures the military renown he has won in this campaign. I heard a very good Sermon from Bishop Lay yesterday at Gen. Hardee’s Hd. Quarters. Quite a number were present, including nearly every Brigadier and Major General in the camps. After Service I rode with Gen. A. R. Jackson to his Hd. Qrs., and had quite a long talk with him. He seems to think that all fighting is over here for the present, unless our army should take the initiative, which it is not very apt to do unless its condition improves very rapidly. He believes that the Yankees will be contented with the success they have accheived and not run the risk of meeting reverses until after the Presidential election – but I can hardly think that they will allow so long a time to pass without active operation. All of my thoughts now are bent upon getting a furlough though i fear that the chances will be small until we go regularly into winter quarters. Gen. Hardee himself made application a few days since for forty-eight hours leave and was refused. When the furlough system does commence though I shall hand in my name first of all, as I am the only Colonel in the Brigade who has not been away from the command this summer. Col. Barkalow did not join us until we were at Kennesaw Mountain. Col. May has only recently returned to duty and Col. Gordon is still absent. We are having delightful weather now, the days are not unpleasantly warm and the nights cool enough to make a blanket desirable. The health of the command must improve if it continues. Love to all at home, and a heart full for my darling. Kiss the babies for me. 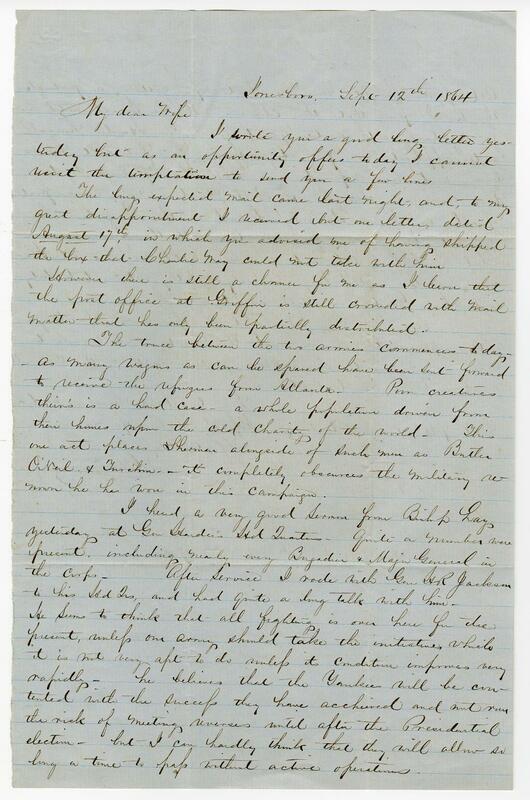 This entry was posted in Southern Historical Collection and tagged Atlanta, Battle of Atlanta, Charles Olmstead, Civil War, General Hardee, refugees. Bookmark the permalink.